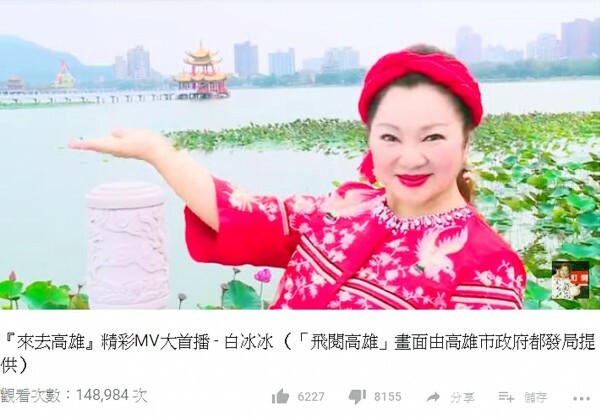 Kaohsiung Tourism Bureau Director Pan Heng-hsu （潘恆旭） yesterday apologized over allegations that a promotional video, produced under contract by actress Pai Ping-ping （白冰冰）, had used unattributed footage from the works of filmmaker Chi Po-lin （齊柏林）. After accusations of plagiarism against Pai surfaced on social media, Taiwan Aerial Imaging — a studio that Chi cofounded — on Thursday said that Pai had used Chi’s 2013 Kaoshiung: A View From Above （飛閱高雄） for her own video Visiting Kaohsiung （來去高雄）. The studio said on Facebook that Chi had specified in his will that, if his films were to be used for non-commercial purposes, they should be played in their entirety. “Out of respect for the original creator’s ideals and creative principles, we request that Chi’s films be played in their entirety,” the studio said. Pan yesterday said that although the bureau believes it owns the rights to the 2013 film, which Chi made for the city government, it nevertheless apologizes for not obtaining the studio’s permission for its use. Earlier yesterday morning, the bureau contacted Taiwan Aerial Imaging and Chi Po-lin Foundation chairman Ou Chin-der （歐晉德）, who tentatively agreed to work with the city on films promoting environmental conservation, he said. Pai was appointed by the bureau as Kaohsiung’s public relations spokeswoman for this month, a decision that sparked controversy in the following weeks. The city reportedly paid Pai NT$500,000 for her video. People have said on social media that five other films she made free of charge for the city also used footage that was not attributed to the original creators.